Foxcroft Academy sophomore basketball player and wrestler Lucas Ames. High school athletes who compete in two activities during the same sports season are not especially uncommon in Maine. More than a few football place-kickers spend most of their time on the soccer field, and basketball players with superior running or jumping skills sometimes divide their time between the court and the track during the winter. Foxcroft Academy sophomore Lucas Ames is thriving with a more unique athletic combination — basketball and wrestling. Ames is a starting guard on the Ponies’ playoff-bound boys basketball team, and last Saturday was crowned the new Penobscot Valley Conference 195-pound wrestling champion. Ames has devoted his winters to both sports since the first grade, winning three New England and three state championships in wrestling at the peewee and middle-school levels while also shining on the basketball court at Central Middle School in his hometown of Corinth. When he joined older brother Elijah as a freshman at Foxcroft last year, he played only basketball. Elijah, a senior, wrestled his way to the Class B North championship and a state runner-up finish at 170 pounds. Lucas Ames’ desire to get back on the mat stemmed from watching Elijah at the state championships. “He was helping his brother at practice and beating him, and when we got to the states and Lucas recognized a kid that he beat as an eighth-grader who was in the finals he thought, ‘If he can be in the finals, maybe I can be in the finals,’” Foxcroft wrestling coach Luis Ayala said. That led to a conversation last fall between Ayala and boys basketball coach Tyler Erickson at Foxcroft’s winter coaches meeting. Ames designated basketball as his primary sport, and Erickson said he has played in every game and missed only one practice this winter while fitting in enough wrestling matches to be seeded for conference and regional competitions. Ames said the coaches last year had feared that doing both sports might lead him to get hurt. “But I was used to doing it and I just kept trying to convince them, and eventually they said I could do both,” Ames said. 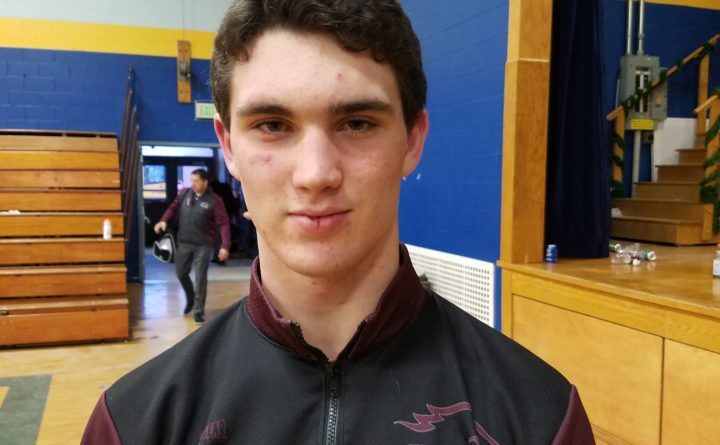 Ames pinned all three of his opponents in a combined time of 5 minutes, 7 seconds, last weekend to capture his PVC wrestling individual title and help Foxcroft edge Dexter by 4 1/2 points for the Ponies fourth consecutive team championship. He should be the top seed at 195 pounds for Saturday’s Class B North regional at Ellsworth High School. The Class A North meet will be held at Camden Hills Regional High School in Rockport, while South regional competitions will be at Noble High School in North Berwick (Class A) and Fryeburg Academy (Class B). Those qualities also have enabled Ames to help the Foxcroft basketball team earn a Class B North preliminary-round date next week. Ames started several games as a freshman and has played nearly every minute of each game so far this season, Erickson said. Ames may run into a scheduling conflict Saturday, Feb. 16. If the basketball team reaches the regional quarterfinals at the Cross Insurance Center in Bangor, the Class B wrestling state championships are being contested at Mattanawcook Academy in Lincoln. “Basketball had to take priority,” he said. “It was the one I picked as my primary sport so I have to go to every basketball game, but whenever I can I try to get to the wrestling meets.